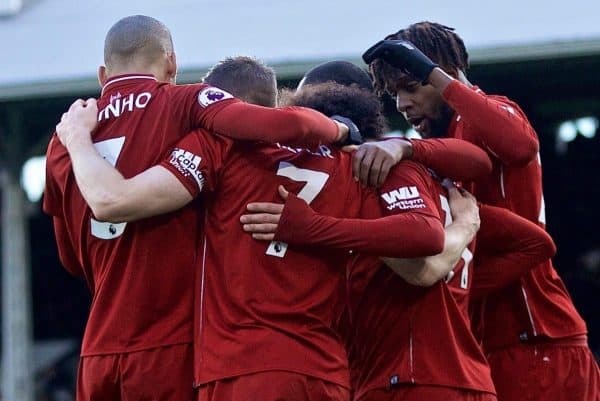 Liverpool returned to the top of the Premier League table after securing a dramatic 2-1 victory over Fulham on Sunday. Liverpool’s first visit to Craven Cottage since 2014 saw Jurgen Klopp‘s men get off to a slow start, only for the Reds’ man of the moment to inject a much-needed spark midway through the first half. An exquisite one-two with Roberto Firmino saw Sadio Mane smash the ball into the back of the net to record his 11th goal in as many games. The Reds controlled proceedings with ease for much of the opening 45, but their wastefulness in possession gave the home side a glimmer of hope. And former Reds winger Ryan Babel was the man to capitalise on an inability to put the game beyond reach after taking advantage of a series of errors at the back. But a late penalty converted by James Milner ensured the Reds left London with all three points and returned to the top of the Premier League table. Here’s how supporters reacted to the result on social media and on our forums. Sadio Mane is unreal at the moment. 20 goals for the season now! Sadio Mané has now opened the scoring in eight Premier League games this season. Only Salah (9) from any club has done so more times (Aguero also 8). Sadio Mané is the best football player the world has ever seen. Pele reincarnation. Mané's 11 goals in these last 11 games: five right-footed, three left-footed, three headers. versatile. Mane is in form of his life! Sadio Mané comfortably Liverpool’s best player yet again. Dominated the ball but it’s been pretty sloppy. Only moment of good play led to the goal. Just need to find the final pass. In control 1st half, solid but at times we've been guilty of treating the game as a training session. A bit more drive & desire and we'd have a couple more goals to go with all the possession. – Kyaw Phyu Aung on Facebook. Weird half. So in control but very sloppy at times. Lallana ineffective on the ball but good off it. Too casual throughout and the Fulham goal epitomised that. Big 15 mins now. – Barry O’Connor on the forums. Alisson at fault for me. Very little that Virgil can do in that situation after that shocking ball from Milner. – Joe Gomez x on the forums. Potentially season defining penalty for Liverpool and James Milner is ice cool to convert it. Mr Reliable from the spot. – hoosierred on the forums. Milner you legend thanks for scoring that penalty but I still hate you for that clearance you gammon head. ? – MarlboroMan on the forums. You don't know stressful until you support Liverpool. That turned out to be thoroughly unenjoyable. – Joe Ryan on Facebook. I turned 43 today. Every single minute of those 43 years flashed before my eyes during that game. Lucky to win.